HOW TO CARVE: A WATERMELON VASE - What About Watermelon? My carvings in the past have ranged from the very simple to the somewhat challenging. This month’s attempt is somewhere near the simple end of the scale. In fact, I’d venture to say it’s probably my easiest carving to date. And, while it may be a cinch to create, it’s also arguably my most attractive creation. 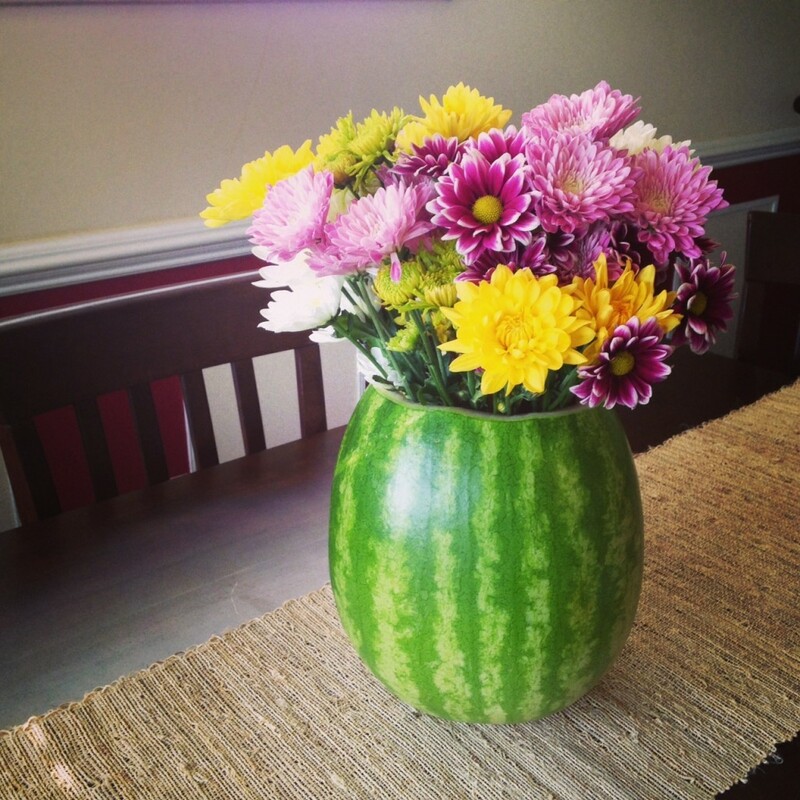 Seriously—all you really need to do to make a watermelon vase is lop off the top and stick some flowers inside. You don’t even need to remove the watermelon flesh! As simple as that may seem, I’ll still walk you through the process with a few photos. As always, start with one clean watermelon. 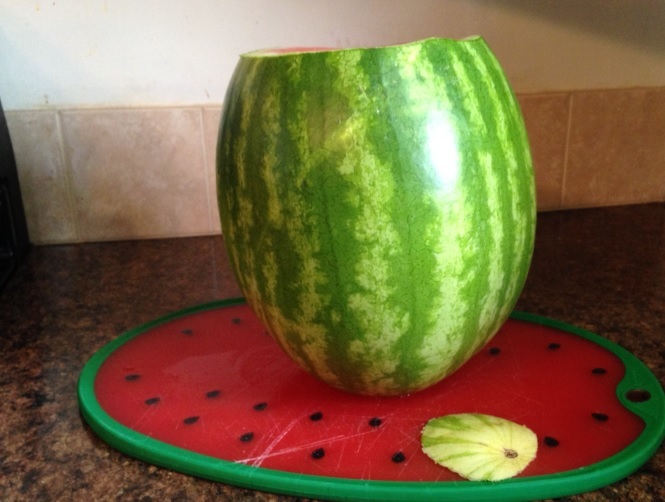 You can create your vase with a watermelon of any size (it depends upon how many flowers you plan to put in it). 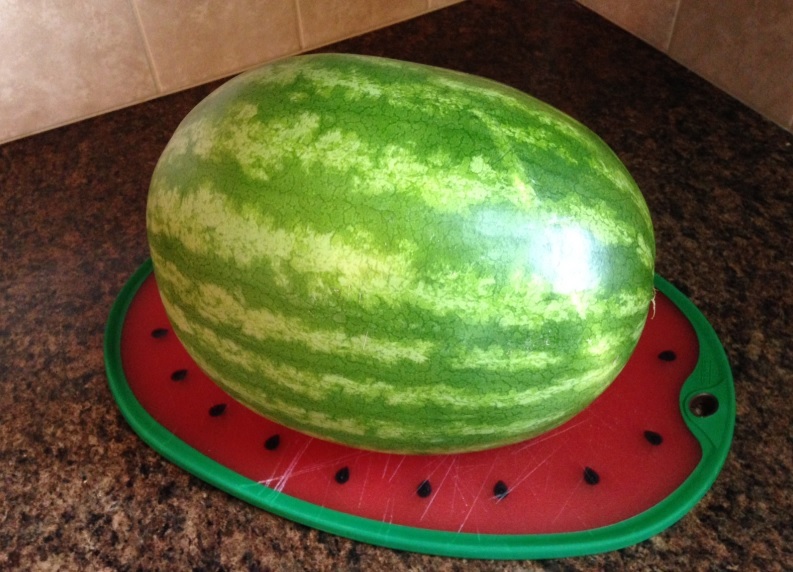 I used a medium-sized watermelon for mine. Cut a tiny part off of the bottom to create a flat base for your vase to sit on. You can see the tiny sliver I cut off in the photo above. Also cut off the top of the watermelon and scoop out the insides. Don’t worry, I made my top a little straighter after I took this photo. After you’ve scooped out the flesh inside your watermelon (put that aside for eating later! ), simply fill your vase with flowers and water, and you’re done! See? I told you this one was simple! Thanks Ellen. The flowers helped me score some points with my wife and I enjoyed the watermelon that was inside. That’s what they call a WIN-WIN!